Implicit-explicit (IMEX) Runge-Kutta methods play a major rule in the numerical treatment of differential systems governed by stiff and non-stiff terms. 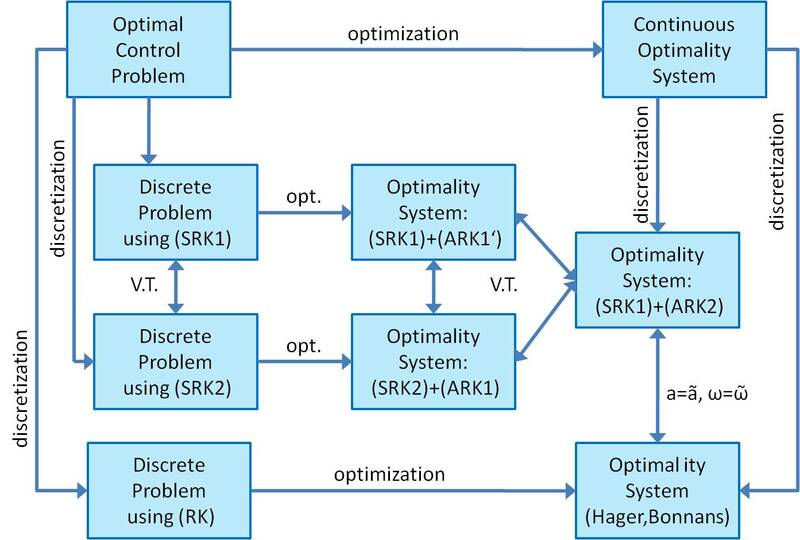 This paper discusses order conditions and symplecticity properties of a class of IMEX Runge--Kutta methods in the context of optimal control problems. The analysis of the schemes is based on the continuous optimality system. Using suitable transformations of the adjoint equation, order conditions up to order three are proven as well as the relation between adjoint schemes obtained through different transformations is investigated. Conditions for the IMEX Runge--Kutta methods to be symplectic are also derived. A numerical example illustrating the theoretical properties is presented.